Neostead Combat Pump-action Bullpup shotgun. Made in South Africa. Caliber: 12 gauge shotgun shell Weight: 3900 g Weapon length: 686 mm > Barrel length: 571mm Capacity: dual over-the-barrel tube magazine, 12+1 rounds total This somewhat unique shotgun is still in pre-production stage: manufacturer promised to begin mass production in 4th quarter of 2001. 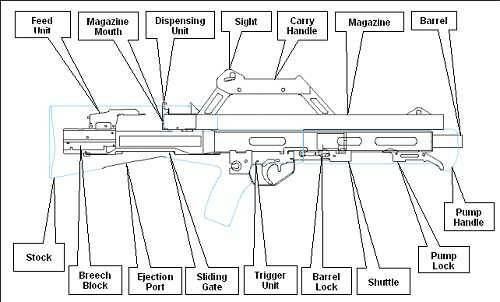 Neostead features twin tubular magazines, located over the barrel; each magazine may hold 6 rounds; user may select, from which tube next round will be feed; also, the gun features "no bolt" design: instead, it has moving barrel; when reloading, the barrel is moved forward and then backward; thus, "pump action" of the forward handguard, which is connected to the barrel, is reversed (most pump action shotguns has "back-then-forth" action). Spent cases are ejected straight to bottom, made this gun completely ambidextrous.